DataFox, meanwhile, is building what it calls “an analytics product for the masses.” As supporters of the JOBS Act and other initiatives that will allow “Main Street” to begin to invest in private companies, the team believes that further down the road, the 170 million Americans who have stocks in their financial portfolios will also be investing in these private companies and will need tools that help them make better decisions related to those efforts. As for how DataFox works, the solution involves mining the world’s public information and applying machine learning to companies’ online presence in order to track 450,000 private and public companies, identify sectors on the rise or fall, draw connections to key people and more. All of this takes place in an intuitive interface that professionals, and even individuals, can adopt in just a few minutes the company claims. 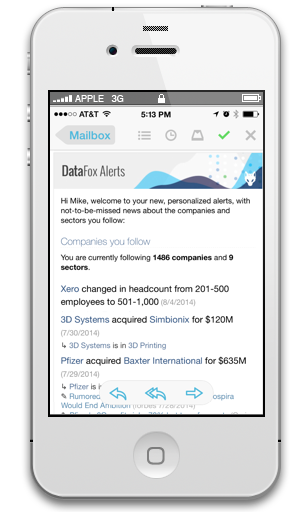 DataFox not only crawls the web to pull in this data, it tracks RSS feeds, and YouTube. Plus, it buys public market data and data accessed through other API partners including CrunchBase, AngelList, LinkedIn, Alexa and more. It also creates its own data via its algorithms, in order to surface new information – like a company’s top competitors, for example. The data is also fairly accurate, as it’s kept up-to-date in real-time, and DataFox automatically flags discrepancies. Users can also help improve the data by flagging things they know to be wrong, which is also then taken into account as well. Though DataFox is undercutting the old guard, those competitors also seemingly support DataFox’s innovations here: the CEO of Dun & Bradstreet is on DataFox’s advisory board, and other execs from Factset have invested in the startup’s $1.78 million seed round. That round also includes investors Google Ventures, Sherpalo Ventures, Jawed Karim (YouTube founder), Social Leverage, Green Visor, Leo Polovets, and the Stanford-StartX Fund. Today DataFox is launching into public beta, offering a three-tier pricing plan which starts at free for non-profits and journalists. (Disclosure: I have begged for, and believe I may be receiving, an account.) It’s then $49/month for individuals and $399/month for those at larger companies. Custom enterprise pricing is also available. DataFox, based in Menlo Park, is now a team of 9 full-time. Judges for this session included Tracy Chou (Pinterest), Josh Elman (Greylock Partners), Markus Spiering (EyeEm), and Hunter Walk (Homebrew); Q&A paraphrased for brevity. Q: Question about data sources. Q: Do you think it would completely replace analysts? A: We empower the analysts to actually analyze, instead of doing the manual number crunching. The analysts will be super-charged. Q: How sophisticated is this analysis? A: We have three experts with backgrounds machine learning and statistics. Q: What’s the proprietary data you have with this? A: At the beginning, we had no proprietary data. But as we go along, as we’re structuring the data the from unstructured sources, we’ve created value.